He essentially doubted the existence of al-Qaida, let alone reports of its attacks on the enemy to the north. “I don’t know anything about Osama Bin Laden that doesn’t come to me through the filter of the West and its propaganda.” To this, Penn replied that surely Bin Laden had provided quite a number of his very own broadcasts and videos. 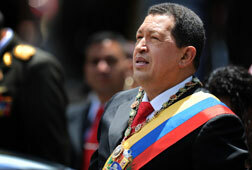 I was again impressed by the way that Chávez rejected this proffered lucid-interval lifeline. All of this so-called evidence, too, was a mere product of imperialist television. After all, “there is film of the Americans landing on the moon,” he scoffed. “Does that mean the moon shot really happened? In the film, the Yanqui flag is flying straight out. So, is there wind on the moon?” As Chávez beamed with triumph at this logic, an awkwardness descended on my comrades, and on the conversation. El resto del artículo no tiene desperdicio. En efecto, el tipo está a punto de declararse un huevo cocido: What I learned about Hugo Chávez’s mental health when I visited Venezuela with Sean Penn. | By Christopher Hitchens.